Art Hindle is a Canadian actor who has appeared in over 30 feature films including such genre gems as Bob Clark's Black Christmas (1974), Philip Kaufman's Invasion of the Body Snatchers (1978), David Cronenberg's The Brood (1979) and Don Carmody's The Surrogate (1984). More recently, he was seen in Offspring (2009) and Monster Brawl (2011). A veteran thespian, Hindle boasts a long resume of episodic television work, including roles on Starsky and Hutch, Baretta, Barnaby Jones, the Friday the 13th series, the Alfred Hitchcock Presents (1989) reboot, and recurring stints on Dallas (1982), E.N.G. (1994, for which he won a prestigious Gemini Award), Beverly Hills, 90210 (1996), Tom Stone (2002), Canadian Case Files (2005) and Paradise Falls (2008) to name a few. Not content with staying in front of the camera, Hindle is also an experienced director, helming episodes of Spynet (2002) and Paradise Falls (2008). These days, Hindle continues to act and enjoys writing for ACTRA's Performers Magazine. 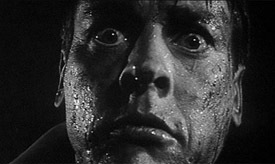 You can meet him at the upcoming HorrorHound weekend November 11-13, 2011 in Cincinnati. Horror and Cinema. Perfect bedfellows. Both need light and shadows. Both are more effective in the dark. Both benefit from a vivid imagination. Horror films date back to the 1890s, from countries like Japan, France and the good old US of A. 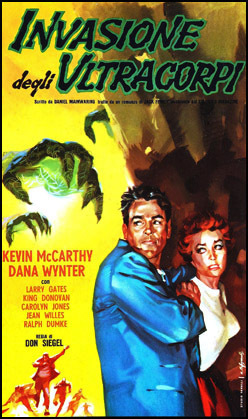 Given that, it’s nearly impossible to avoid the Horror/Sci-Fi Genre growing up. And so it was with me. My mom was the cinephile. She loved life up there on the big screen. She had started her moviegoing at an early age even though her family were poor, and then through the loss of both parents - one to illness, the other driven to drink by the horrors of World War I. She used to pick up the discarded stubs of exiting movie goers to avoid the cost of admission. When I came along, she would do the same thing. I mentioned this to her when I was older and she told me she had another technique as well. When the show would let out, she would “walk” in backwards…she said she and I did this a lot when I was a little one. Mom was always going against the flow. Literally! And so it was the time she took me to see a film that would not only have an effect on me as a child, but would also have a profound influence when I was older. 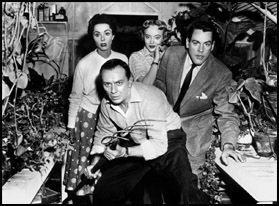 That was the first version of Jack Finney’s book The Body Snatchers which became Invasion of the Body Snatchers (1956). I think my heart was as broken as his when he returned. And oh, the shock I suffered when I thought that at last our hero would be safe as he jumped aboard the passing truck...only to discover a load of “pods’ heading for the big city…maybe “my” city! I could no longer trust watermelons. It explained the odd behaviour of some of the adults in my world. It was the first Horror Film I had seen. Why my mother took me to this one I’m not quite sure, although she was always interested in how people worked. Ironically, she was the one who kept prodding me to explore acting. Which I did. Flash forward twenty some odd years later. I met with director Phillip Kaufman and producer Bob Solo for a little project they had in mind…a remake of Invasion of the Body Snatchers! A '70s remake! The rest, as they say, is history. It was my first Hollywood movie and a smash hit in its own right, besides being one of the best remakes ever. I remember seeing Invasion in Toronto the following year (where I was doing my next film, David Cronenberg's The Brood, which I thought was going to be a disaster, but that's a different story...) The crowd at the Uptown loved it! I loved it and still do. So many nuances in it…I could watch it every week!